As promised in a previous post, I made duck sausage to complete the June Charcutepalooza Challenge. My local gourmet provisioner makes an excellent duck sausage with cherries, which, along with mushroom risotto, was a favorite food of a certain two-year-old in our household. Ruhlman’s Charcuterie recipe uses garlic, sage, and red wine, but at the suggestion of She Who Must Be Obeyed I worked out a variation that used cranberries. Charcuterie‘s recipe also calls for pork fat to be mixed with duck leg meat, but I figured that I’d have more than enough duck fat from boning out the legs to make the supplemental pork unnecessary. (I know, I actively avoided the use of pork fat in a recipe.) My concern was with how soft duck fat can get at room temperature, which could lead to smearing in the final grind. 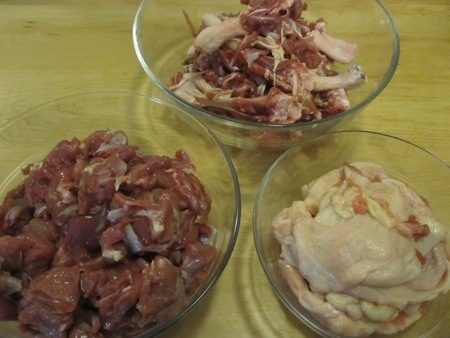 In response to my email query, Ruhlman suggested I could supplement the fat and skin from the legs with frozen, diced, rendered duck fat, which I had in abundance. 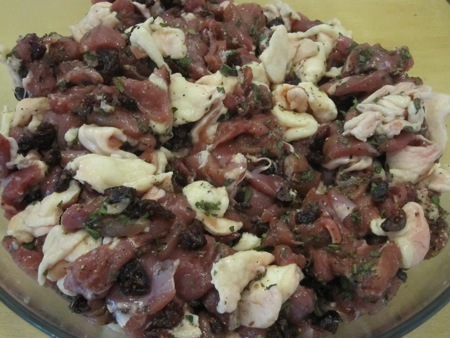 I retrieved my stash of duck legs from the Deep Storage Facility and began separating fat, skin, meat and bones – a process that got easier after the first eight legs – and wound up working my way through eighteen legs to get the required weights: three and a half pounds of diced meat, a pound and a half of fat and skin (just enough, no additional fat required), and a bowl full of very meaty bones. I could have been a bit fussier about removing more meat from the bones, but I didn’t want to spend a few more hours teasing out dozens of tendons from each leg. Besides, I had another use in mind for the bones: blanched, and then simmered with onion, ginger, cilantro, coriander seeds, and fish sauce, they became four quarts of duck phở. 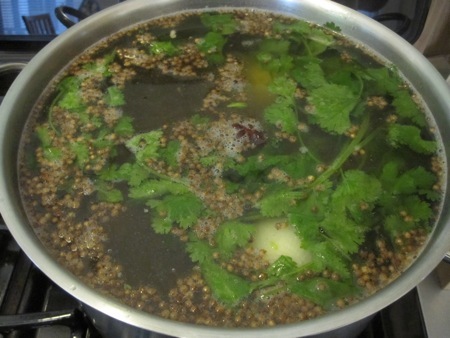 The rendered tendons added a lovely gelatinous oomph to the stock. 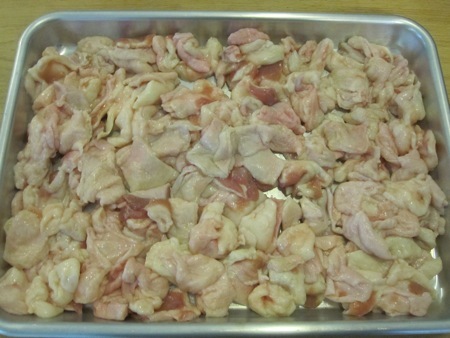 While the fragrant stock simmered (quite a calming influence in the Belm Utility Research Kitchen) I cut up the skin and fat into one-inch chunks with kitchen shears and set them on a sheet tray which went into the freezer for about half an hour. If I kept the fat as cold as possible I stood a better chance of it remaining well-defined in the final grind. 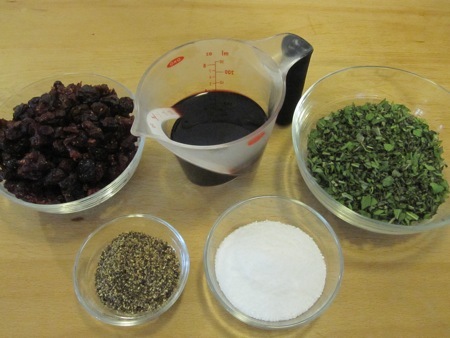 I assembled the seasonings: about a cup of chopped dried unsweetened cranberries, half a cup of finely chopped fresh sage, salt, coarsely ground black pepper, and half a cup of ruby port. I tossed the duck meat and fat together with the seasonings and let them chill again in the fridge along with the port. 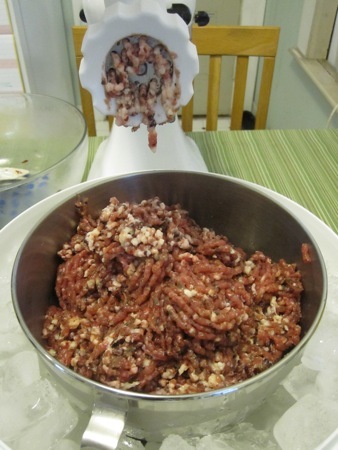 I set my mixer bowl in salted ice water and pushed the seasoned meat through the grinder. I added the port and half a cup of ice water, then combined the mixture at medium speed for a minute. I made a small patty out of the stuffing, sautéed it and checked the meat for seasoning (spot on), and then recruited She Who for her expert sausage handling skills. 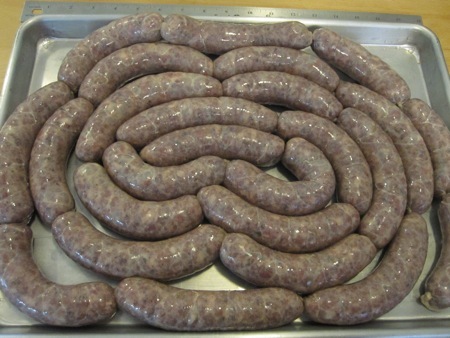 Within half an hour we had twenty five links of duck sausage. I portioned the sausages into four meals’ worth of links, keeping one in the fridge and sending the rest to the Deep Storage Facility. For dinner I cooked polenta, wilted swiss chard with garlic scapes, and made a quick sauce by reducing some duck stock with the same port and a sprig of thyme. 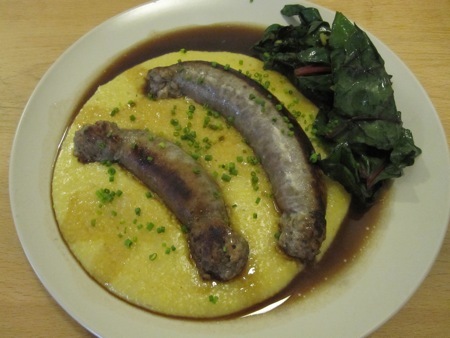 I served the sausage over the polenta and added a healthy splash of the sauce. This entry was posted in food & cooking and tagged charcutepalooza, cooking, duck, food. Bookmark the permalink. That was a lot of duck leg; where do you get yours?